Crates can be a contentious issue in the world of dog behaviour and training. Some people will be aghast if they see a crate in your home, exclaiming that it is cruel to imprison your dog in one! Crate training is NOT cruel – when done properly! If a crate is introduced carefully and in a positive manner, it can actually be quite the opposite of a prison. It can become a safe, secure and relaxing space for your dog that they seek out when they want to rest and have their own space. There is no denying though that if a crate is introduced inappropriately, if your dog has had a previous negative experience with one or if it is used for the wrong reasons that it can become something that your dog can hate and even fear. It is all about making sure that it is introduced in the right way and for the right reasons. When pup first arrives home, it is no surprise that they will have some accidents. They haven’t been taught what is expected of them in terms of where to go potty and you need to give them the time and tuition for this all to click into place with a solid house training regime. It can be a particular challenge trying to avoid accidents happening through the night when it is more difficult for you to be looking for the signs that your dog needs out and they are left unsupervised for longer periods. Your puppy will have an instinctual desire to keep their bed space clean so, unless they are not able to hold on, they will generally be less inclined to soil the crate. This can help them with creating bladder control and also means you will then be able to get them outside straight after they come out the crate, they will hopefully go to the toilet and you can then reward them very heavily for this. We all know that puppies go through a teething phase when they are much more likely to be looking for things to chew on. Puppies are also naturally curious and investigative. If you have to leave your puppy unsupervised for short periods, if they are left to their own devices in the house it can be difficult to ensure that everything is completely puppy proofed. If your dog is happy being left in a crate for short periods, with some safe chewing toys (like a Classic Kong), then they will not be able to put themselves at risk of chewing on something dangerous or causing any damage to valued household items. If a dog has undergone major surgery, sometimes a vet will advise that mandatory crate rest is required. This is when a dog needs to be kept from moving around much at all to allow the body to heal. If they are allowed to jump about it could cause further injury or the surgery may not be a success. If you have a dog that has been taught to settle well in a crate this can be a great way of ensuring they do not do anything that could jeopardize the success of the surgery. Your dog really needs to be used to the crate otherwise they could actually injure themselves trying to get out in their panic and it is important to ensure they have plenty enriching toys and plenty opportunities to get out for toilet breaks and supervised attention. If you have a fearful or anxious dog you may notice that they try to hide under the table or the bed when they are nervous. By providing them with a safe and cozy den space it can help to make them feel more secure and lessen their anxiety knowing they have a comfortable area that they can seek respite in. Whenever you travel with your dog in the car it is important, and in some countries a legal requirement, that your dog is appropriately secured or restrained. Some people choose to use a car harness, but if your car seats are all taken up by other passengers, your dog is very big or they don’t settle and get themselves all tangled or uncomfortable in the seat belt harness, then a crate can be a good alternative. A smaller crate can fit on the back seats of the car but it is more commonly placed in the boot of the car. It keeps your dog secure, they cannot distract the driver by trying to climb through to the front, they have the space to lie down, settle and get comfy and they will be safer if there is an accident or if you have to brake or turn harshly. If you have a mucky, wet dog after a walk, it also means that the mud is contained in the easy to clean space of the crate. If there are multiple dogs travelling and they can get excitable or grumpy with one another in the close confines of the car, using crates keeps them safely separated. One of the most common reasons for using a crate is to provide a comfortable and secure sleeping space for your dog. It is not just anxious dogs that can find the den-like space cozy and comforting. If it is introduced in a positive fashion, it can be a space that your dog retreats to for relaxation and it may save your dog from becoming restless through the night. Sometimes if you have more than one dog, a crate can become a useful management tool. If your dogs are fed in their crates it can help to minimise any potential resource guarding issues. It can be useful if you are doing individual training sessions. Whilst you are doing this, your other dog can be resting in their crate with a tasty chew toy. If your dogs can become a bit unruly with one another when they are unsupervised, if they have crate time when they are left for short periods, providing they are relaxed in their crates, this can save any worries about scuffles or over the top play sessions. If you have a puppy and an elderly dog it can mean the senior dog has a space to go to get some peace away from an energetic pup. If your dog is getting over enthusiastic when visitors arrive or some other situation that has resulted in them getting over-excitable, you can use a crate as a space to encourage them to calm down. They can go there with a tasty chew or toy to settle and avoid them becoming over-aroused and then making it difficult for them to relax. There are a number of situations where it is not recommended to use a crate and others where it can actually be very damaging. It is important to make sure that it is always used appropriately, without force and in a positive fashion. Whilst an appropriately sized crate can be a safe and comfortable space to leave your dog for a few hours during the day or overnight, leaving your dog for extended periods too frequently can be damaging for your dog both mentally and physically. If your dog is not getting enough exercise and just cooped up in a crate they can develop mobility issues and it can also result in your dog being under-stimulated without enough mentally enriching engagement or activity. Make sure your dog gets plenty of fun time, company and activity outside the crate too. This is one of the most common problems with crates. People start using them as somewhere to put a dog when they are misbehaving either just to stop them doing it or as a form of punishment. This is really a bad idea. It can create a negative association for your dog so they will no longer willingly go into the crate. It stops being a fun or relaxing space for them. By putting your dog in the crate as a result of unwanted behaviour you are not teaching your dog anything with this action and your dog will likely continue with the behaviour whenever they are out of the crate anyway. It is much better to teach your dog an alternative behaviour and to reward them whenever they stop the unwanted behaviour. So, for example, if your dog is barking, why not ask them to do something else instead or make sure that when they give you five seconds of quiet that you reward it so they know that quiet behaviour means they get good things. If a dog is suffering from severe separation anxiety they can start to become disruptive in the house, chewing things in their distress or sometimes even having accidents. Some people will use a crate to prevent the damage from happening. This is not the right way to handle separation anxiety unless your dog is super relaxed in the crate when you leave. If they continue to be distressed in the crate they could risk injuring themselves trying to escape and they will continue to be in a distressed state and will likely still bark and howl. IIt is much better to work on a behaviour modification programme, in conjunction with a qualified behaviourist if the problem is severe, to teach your dog to relax more when they are left on their own. There are no quick fixes when it comes to separation anxiety, but if you put the work in, it will mean you have a much happier dog and you won’t have to worry about complaints from neighbours and potential damage occurring in the house as a result of your dog’s anxiety levels. So, how do you ensure that your dog learns that the crate is a place to love rather than loathe? By following the simple steps below and making sure that you are patient and consistent you will likely have a dog that can’t wait to get into their crate in no time at all. The most crucial aspect of successful crate training is to make sure that everything about the crate is positive for your dog. You should pair it with delicious treats and safe chews and treat toys whenever possible. Make sure that your dog’s crate is kitted out as comfortably as possible. Make sure there is a bed that fits well, doesn’t slide about and still gives your dog adequate space to move. Pick a suitable space in the house for setting it up. A place that is free of draughts, is not too hot, is peaceful and is still allowing your dog to be part of the family if they are in it whilst you are about. By feeding your dog in the crate, not only does it give them a space to eat their dinner in peace, without disturbance, but it also means that they continue to get positive associations with the crate. Crate means food and a comfy space. Whenever you are asking them to go into it when it is not feeding time, make sure that they go in voluntarily and they are rewarded with some yummy treats. You may need to start by throwing treats inside the crate to encourage them to enter themselves and then follow this up with them being fed more once in. Whilst you are building up the duration they are inside you could also give them longer lasting chews or treat toys inside it so that they are happy to stay in for the longer periods. Make sure that when you first start crate training that you don’t immediately close the door. Blocking your dog’s exit whilst you are still teaching them to associate the crate with positive things and have them relax in it can be too much, too soon and it is much better to get them to go in and stay in voluntarily with the door open. Once they are happy to be in the crate for longer periods and will stay in, relax and even lie down and sleep then you can start to gradually work on opening and closing the door whilst they still remain relaxed. Every time you close the door they should get a treat and the same when you open it. You should build up from just a few seconds of closure gradually. Once you do start to close the door, make sure that you don’t immediately just leave them for long periods. Even just ten or fifteen minutes closed in can be too much too soon for some dogs. There will, of course, be some dogs that love it from the start and are perfectly happy to just go in and stay in with the door closed for longer periods without very much training at all but most dogs will need to be built up to longer sessions more gradually. Starting with short ten-second durations, then a minute long, then five minutes long, then ten minute long sessions and so on. And, as before, every session should be paired with lots of yummy rewards. When you do start leaving your dog in the crate for longer periods it is better to initially do this when you are still in the house. Leaving your dog for a prolonged period whilst you are not around means you are not there to make sure they are not getting seriously distressed. Sometimes you need to adjust your training schedule and take it back a notch or two if you are progressing too quickly. Don’t leave them unsupervised until you are 100% your dog is totally relaxed in the crate for a longer period, even when there is no one in the room with them. You obviously don’t want to leave your dog whining, howling or barking for prolonged periods in the crate. Not only will this likely end up with them having negative associations with it but it is not good in terms of neighbours either. However, sometimes a small amount of whining is not too big a deal. Often your dog may whine just for a few minutes and then settle down. If your dog does start whining it is important to try to wait for a few minutes of quiet before you let them back out so that they don’t learn that whining will get them out of the crate and mean they do it even more. If you are having a puppy in the crate at night and they start to whine, if they are doing this because they need the toilet, you would prefer to be able to let them out to avoid them having an accident and setting back their toilet training. Try to wait for a moment of quiet and then bring them out, with minimal fuss to the garden. If they just want to play and obviously do not need the toilet then again, bring them back up with minimal fuss and then try to ignore any whining after this as it seems it is just for attention and not for toileting. Don’t ever force your dog into the crate, always ask them to go in voluntarily. At first, you may need to lure them in with some tasty treats and this is fine. By forcing a reluctant dog to go in, you will only give them more negative associations with the crate and the aversion to it is likely to just get worse and you probably won’t ever be able to get them to settle successfully. If you are struggling to get your dog to settle in the crate you may need to come up with some other strategies whilst you go back to basics. If you really feel a crate is needed it may be best to consult with a qualified behaviourist at this point just so they can keep you on the right track with appropriate steps to take. There may be something small that you are doing wrong without realising and the behaviourist may pick up on this very quickly. If you introduced a crate for a specific training reason, perhaps it would be best to just look at different management and training tools instead. You may need to employ additional help in a dog walker, daycare or home boarding. You might need to use baby gates and you may need to up your attention to toilet training. Try to remain patient and not go too fast with crate introductions, it is all about slow, steady and positive. It will really pay off, in the long run, to take it slow. If you try to rush it you could be asking too much of your dog and they could end up becoming stressed in the crate and that is the last thing you want. It is really important to remember that this is a safe, secure and relaxing space that is specifically for your dog. If you have children you should teach them that when your dog is in the crate they must give him space and peace. If you have a nervous dog that has a crate as a place of refuge and they go there when they are feeling anxious, if they suddenly have an excited and noisy child trying to join them, not only does this mean the crate is no longer the refuge that they have come to expect but it could mean that you are putting your child at risk of getting growled at or even bitten by a very frightened dog that is already struggling to cope and is feeling trapped. Some people get rid of the crate once their puppy is fully toilet trained or is no longer chewing. Don’t forget that your pup may have come to enjoy and expect this space. Just because they no longer need it for the reason you introduced it, it does not mean that they will not continue to benefit from it. If they enjoy the space and relax in it and you have room, why not keep it. Metal crates are the most common types used. They are very robust, likely to last a lifetime, are easy to clean, well ventilated and there are a wide range available from many suppliers so you can choose from budget to premium. They will withstand chewing and scraping and, unless your dog is a super special Houdini, they are very difficult to get out of once closed over. This option from MidWest is a reasonable price, well reviewed and comes with a divider too. It is only a single door option though (some come with a side and front door opening). They usually come with a removable plastic tray in the base that can be taken out to be cleaned. Metal crates can be a bit noisy when faced with the vibrations of a car, the metal door can jiggle slightly and whilst it can be an annoyance for us it can freak some dogs out. Plastic crates are more commonly used for small breed dogs that can to be easily transported. Because they usually have more solid sides with ventilation holes and they have a handle, they can be useful for use in the car, when visiting the vet and the likes. They are often the required style for air travel for dogs. If you have a dog that likes a space that blocks out too much stimulation this can be a good option. They are not as tough as a metal crate and they could crack if dropped and are not as able to withstand any chewing. 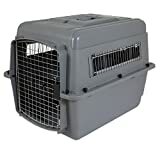 The Petmate Sky Kennel Plastic Crate has good reviews, is reasonably priced and also meets with a number of the airline requirements too. Fabric crates will not make the annoying noise that a metal crate can, it can also fold up as a more light option for transporting and it is comfortable for your dog to lean against the side of. They tend to be pretty expensive though and they are nowhere near as tough, so if you have a chewy dog they might not be the best investment. If the zip shutter is chewed it makes it unusable unless you are an accomplished seamstress. If a dog does have an accident in it it can be more difficult to clean too. The EliteField Fabric Crate is well reviewed and not too expensive. It is really important to ensure you pick an appropriate size. You need to select a crate which will allow your dog to stand up without having their height restricted in any way. They should be able to lie down and even stretch out somewhat comfortably. Make sure you allow for growth if you are purchasing one for a puppy that you want to continue using to adulthood. If you go far too big, the crate may not be a cozy enough space. If you do have a puppy that is a prolific mischief maker and they will chew on things as soon as they are left unsupervised, even if you think you have properly puppy proofed your house, or if you have children that you don’t want to leave pup with unless you are able to keep a close eye, then you may want to consider also investing in a puppy pen. It is not a necessary investment, but if you are struggling to keep an eye on them all the time then it may be helpful and it gives your dog more space and freedom than a crate will. You do need a decent amount of living space to set the puppy pen up though and, again, it is not something that they should be left in all day. It is important that when you are selecting a bed for your dog’s crate that it is one that is not too voluminous so that it makes it difficult to get in or out of the crate or that is so deep that it may take away some height causing your dog to hit their head on the top. It should also be a nice snug fit so that it does not slide about the crate. You may want to make sure it has a non-slip base or add a non-slip material underneath to keep it from moving. For puppies, just in case there is the odd accident, pick something that washes well and dries easily. It is possible to buy crate mats that are made to fit well inside the crate. They are usually flat but with bolstered sides. It is all about finding out what your dog enjoys and what fits well. Some dogs still prefer to have a cozier style bed and a mat would not be enough. For dogs that like to be really cozy and have a proper den space, you can consider a crate cover. 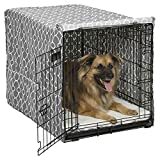 These are usually a fabric material that has been designed to fit over the sides and top of the crate, leaving the front open for ventilation and to allow your dog to get in and out easily. 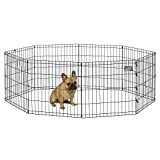 These are particularly useful for dogs that are anxious and enjoy having a secure, enclosed space to retreat to. They can also be good for dogs that can become overstimulated in a busy environment, so if you have a crate for your dog when you are at a dog sports competition, for example, having a cover can be useful to allow them to have some respite from the hubbub. If you are using a cover it is important to pick the right size and make sure that the crate is still well ventilated.